Here is all the latest news and rumour from around Leagues One and Two. Former Barnsley boss Paul Heckingbottom has re-emerged as a leading contender for the managerial role at Hibernian after talks with Michael Appleton stalled. The Edinburgh Evening News understands the pair are seen as the outstanding candidates, with Heckingbottom now favourite for the job. That said, while negotiations with Appleton have hit a wall at this present moment, they are to be brought to a conclusion. Blackpool manager Terry McPhillips has bemoaned the decision not to award his side a second-half penalty in a 1-1 draw with Sunderland on Tuesday. Referee Carl Boyeson brought his whistle to his lips when Antony Evans was brought down but then changed his mind, allowing the game to continue. “It hasn’t gone for us and we’re really disappointed but we have to get on with it,” McPhillips told the Blackpool Gazette. “We’d probably have taken a point before the game but there’s a real disappointment and frustration in the dressing room that we haven’t got all three points. “We certainly thought we should have had a penalty. If you get the penalty and you score it, you’re in the driving seat, so that’s disappointing. “It was nailed on. I don’t need to watch the video – it’s easy. The referee has got that one wrong and when their lad goes down he doesn’t give it, so if it’s not a penalty it’s a dive and should be a booking. Luton Town striker James Collins has admitted he’d “love an international call-up” with the Republic of Ireland squad set to be announced soon. The 28-year-old, who has represented his country at U19 and U21 level, scored his 19th of the season on Saturday under the watchful eye of Ireland assistant coach Robbie Keane. Collins spoke to Luton Today and said: “I’d love an international call-up, it would be a massive thing for me personally and my family, but I’m focused on doing well for Luton Town at the minute. Doncaster Rovers manager Grant McCann has apologised to his players for questioning whether they would slip up at Southend United last night. Rovers hit three without reply against the Shrimpers to stay in the the League One playoff places. But with this weekend’s FA Cup fifth-round clash with Crystal Palace to come, McCann publicly apologised for doubting his players’ focuses. “I was a wee bit worried about this game. I was driving up this morning and I said to my staff I'm a wee bit worried," said McCann to the Doncaster Free Press. "I don't know why. I shouldn't have done. I shouldn't have even questioned the mentality of this group, and I said that to them in the dressing room after the game. "I apologised to them. The way they performed after such a tough game at the weekend and the character to win the game was great. 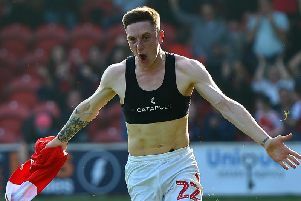 Charlton Athletic chief Lee Bowyer’s bid to bring in free agent Joe Mason has been blocked by owner Roland Duchatelet. It was reported last week that Plymouth Argyle had approached the striker over a Home Park return, and could still land the 27-year-old following the Charlton news. “He (Mason) is the one that we were looking to bring in,” Bowyer told South London Press.